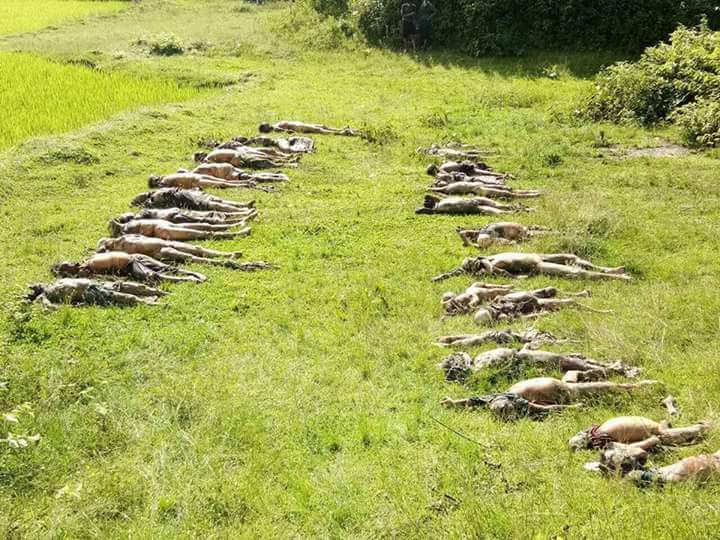 YANGON – Security forces unearthed 45 dead Hindus, including six children, near Ye Baw Kya village in northern Maungdaw Township, Rakhine State, according to a statement issued by the government’s Information Committee and later reports from a Hindu community leader. The government’s statement — based on Hindu community leader U Ni Mal’s testimony — on Sunday said members of Arakan Rohingya Salvation Army (ARSA) arrested some 100 men and women from several Hindu villages in Kha Maung Seik village tract on Aug. 25 and killed the majority of abductees. U Ni Mal told The Irrawaddy this afternoon after he and villagers assisted security forces in searching for additional burial sites. The community leader claimed the 45 deceased were brutally killed and some were beheaded or had their throats slit. Among the bodies were 20 women, 19 men, and six children. A mass grave of 28 was found of Sunday, with 17 discovered on Monday afternoon. U Ni Mal said that the Hindu community had verbally and officially requested that authorities and Arakan National Party lawmakers looks into the deaths, but that there were delays due to security concerns. The UN estimates that some 500 Hindus fled to Bangladesh after Muslim militants attacked border police posts on August 25 and resulting Myanmar Army security clearance operations have followed. The refugees are sheltering in makeshift camps on the Bangladesh border alongside a UN-estimated 420,000 self-identifying Rohingya Muslims. U Ni Mal expressed that the Hindu community “wants justice” for these attacks. Some 30,000 Hindus and Buddhists in Maungdaw were also displaced to other areas in Rakhine State after military clearance operations began following Arakan Rohingya Salvation Army attacks on border police posts. During a visit by The Irrawaddy’s reporter in early September, some Hindus expressed that they would no longer live alongside Muslims in Maungdaw if the government planned to relocate them. “We are not comfortable living alongside them anymore,” said U Ni Mal.